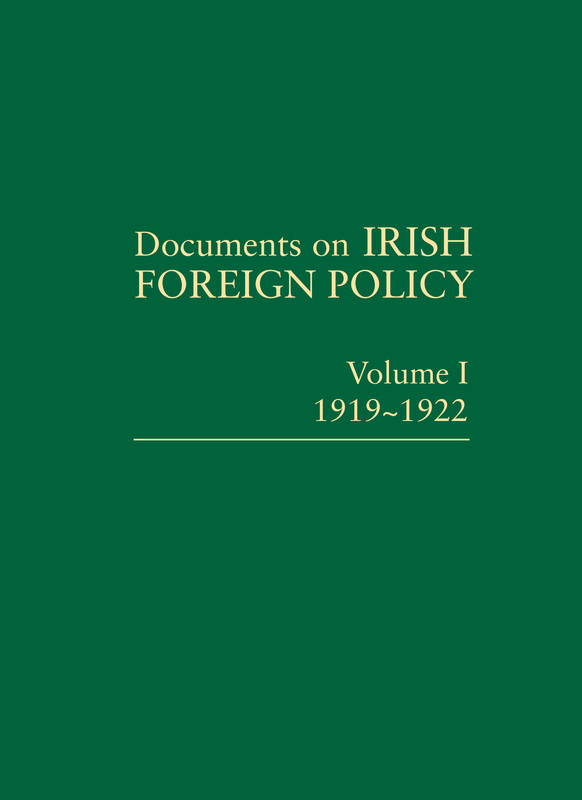 ‘Volume I’ of the ‘Documents on Irish Foreign Policy’ series is a documentary history of the forging of Irish foreign policy and the Irish diplomatic service amid the backdrop of a bloody civil war. It begins on 21 January 1919 with the opening of the First Dáil (parliament) in Dublin and the publication of the Irish Declaration of Independence. It closes on 6 December 1922, the date of the founding of the Irish Free State, one year after the Anglo-Irish Treaty was signed. The intervening years covered in this volume were turbulent: a bitter political and military clash in Ireland, the British partition of the island into Northern and Southern Ireland in 1920, a negotiated settlement giving Southern Ireland dominion status through the December 1921 Treaty, and the emergence of the Irish Free State amid the violence of a civil war which began in June 1922 and ended in May 1923. These years also saw the birth, near death and re-birth of the Irish Department of External (now Foreign) Affairs, where these foundational documents were written into history. The volume includes previously unseen letters from Michael Collins, Arthur Griffith, Eamon de Valera; confidential despatches and political reports from Irish diplomats, including accounts of the fundraising activities of Eamon de Valera and Harry Boland in America. It is indispensable to historians of modern Ireland. Ronan Fanning MRIA was Professor of Modern History at University College Dublin. He was an editor of the Documents on Irish Foreign Policy series and a founder-member of the Royal Irish Academy's National Committee for the Study of International Affairs. He was joint-editor of Irish Historical Studies from 1976 to 1987. He was the author of The Irish Department of Finance and Independent Ireland and co-editor of Documents on Irish Foreign Policy: Volume I, 1919-22, Documents on Irish Foreign Policy: Volume II, 1923-1926 and Documents on Irish Foreign Policy: Volume III, 1926 â 1932. He published scholarly articles in journals throughout Europe and North America and was a regular political columnist for the Irish Sunday Independent. You can find more information on the Documents on Irish Foreign Policy research project here. Catriona Crowe is Head of Special Projects at the National Archives of Ireland. She is Manager of the Irish Census Online Project, which has placed the 1901 and 1911 censuses online free of charge over the last 5 years. She is an Editor of Documents on Irish Foreign Policy and of Dublin 1911, both published by the Royal Irish Academy. She is Vice-President of the Irish Labour History Society, and a former President of the Womenâs History Association. She is Chairperson of the Irish Theatre Institute, which promotes and supports Irish theatre and has created an award-winning website of Irish theatre productions. She is Chairperson of the SAOL Project, a rehabilitation initiative for women with addiction problems, based in the North Inner City, and also Chairperson of the Inner Cirty Renewal Group, which delivers employment and welfare rights advice and support to the community in the North Inner City. She contributes regularly to the broadcast and print media on cultural and historical matters. She is a member of the Royal Irish Academy. Dermot Keogh MRIA is Professor of History at University College Cork and an editor of the Documents on Irish Foreign Policy series. He has been a Fulbright Professor in California, Fellow of the Woodrow Wilson Center in Washington and Jean Monnet Professor of European Integration at University College Cork. He is the co-editor of Documents on Irish Foreign Policy: Volume I, 1919-22, Documents on Irish Foreign Policy: Volume II, 1923-1926 and Documents on Irish Foreign Policy: Volume III, 1926-1932. He is the author of numerous books on Irish diplomatic and political history, including Ireland and Europe, 1919-1989, Ireland and the Vatican: The Politics and Diplomacy of Church and State, 1922-1960, Twentieth-Century Ireland: Nation and State and Jews in Twentieth-Century Ireland: Refugees, Anti-Semitism and the Holocaust. The recent hot weather saw a number of archaeological remains come to light across the country, but a gorse fire on Bray Head revealed a remnant of the more recent past: a World War Two vintage 'Éire' sign.